Primary colors have been put through the retro spin cycle for this Aqua and Red Classroom Design Kit. These two bring the perfect blend of traditional and trendy to your classroom. 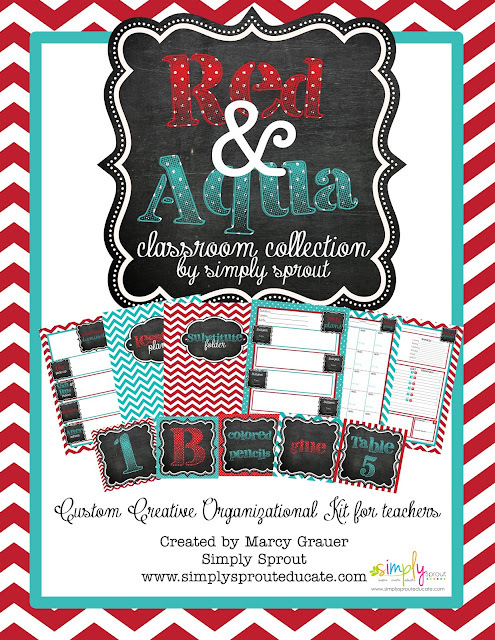 Start the year off organized and coordinated with this stylish red & aqua printable kit. Polka dots, chevron and stripes mixed with chalkboard frames are the perfect stylish combination to bring yourclassroom to life this school year. Customize your classroom by adding your own text and printing exactly what you need. The school supply aisles are filled with fun colorful finds like composition notebooks, folders, binders, and more. All to coordinate with these cool and warm tones. We found these adorable composition notebooks at Wal-mart. So fun & fresh sure to brighten up your student desks, and make learning a little more fun! Organization is key when starting out a new school year. We love how these bright binder covers turn ordinary to extraordinary! Just print them and slide them into any clear pocket binder. Storage crates and supply bins share in on the pops of color! These adorable berry baskets were found at Wal-mart, we just added some colorful ribbon ( Hobby Lobby) and the tags from the Red & Aqua Classroom Collection. The combination of dots and chevron will catch the eye of the students right away, as well as parents and teachers! Get your Red & Aqua Classroom Kit today! A Few Things All About Me: A Student Sneak Peek!